I’ve always liked this photo, I have it framed on my office wall. Of course I have lost the original high-res version of it… I took it, did my editing for my website, and threw away the original – which was stupid… because only afterward did I realize what a great shot it is! It is a wonderfully captured moment with nice composition and lighting. This was taken on the New England 1000 rally, in 99 or 2000, (I’m too lazy too look it up at the moment.) On the first or second day of the rally the car broke. A clutch hinge pin fell out to be exact. The rally has the good forture of having the Markowski’s as the official rally mechanics. The Markowski’s run RPM, one of the best restoration shops on the planet. On the right is my father, and he is talking to (standing) Steve Markowski and if I recall correctly the kid leaning against the wall of the trailer is named Eben. 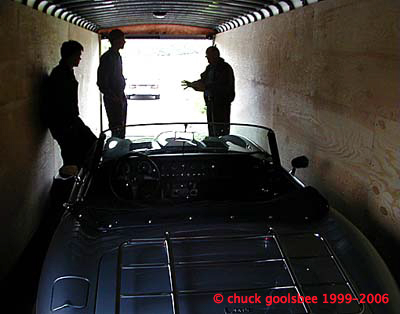 The E-type has just been pulled into the trailer and my father is describing what happened. What ensued was a miracle. I firmly believed that the rally was over for us. Anyone that knows e-types understands that clutch and transmission problems are impossible to address in a swift fashion. But somehow … using flashlights and surgical tools these two mechanical geniuses who were weren’t even old enough to drink at the time, managed to re-insert a clutch hinge pin through a hole in the bellhousing and get us back in the rally again the next morning. I recently fixed the car’s latest ill, and am humbled by the abilities of these guys. I am the world’s slowest mechanic… I do not rush things and really don’t mind taking forever to address an issue. To me working on cars is a thing to be savored and enjoyed. I could never do it for a living, because I’m just too damn slow. These kids (who are now grown men) were born for the task. Good to have people like that around. Yin & Yang. It really is a pleasure to watch someone with a gift do what they’re gifted at, whether it’s mechanical or musical or, in my case, slob-ical.